We will be visiting the Game Developers Conference in San Francisco from 5 to 9 March. It was a last minute decision. The Benelux Game Initative is offering us some space in their booth (5310 NH) where we’ll be showing The Endless Forest and the first teaser for our new project, The Path (formerly 144). It’s likely that we will mostly be roaming around, attending lectures and hanging out. So if you want to meet us, please email us, preferably in advance. On March 8, Patrick Dugan will be presenting a poster session entitled “First-Generation Drama Engines”, featuring, amongst others, Drama Princess. Tale of Tales screensaver Vernanimalcula included in art collection of the National Bank of Belgium: free download! 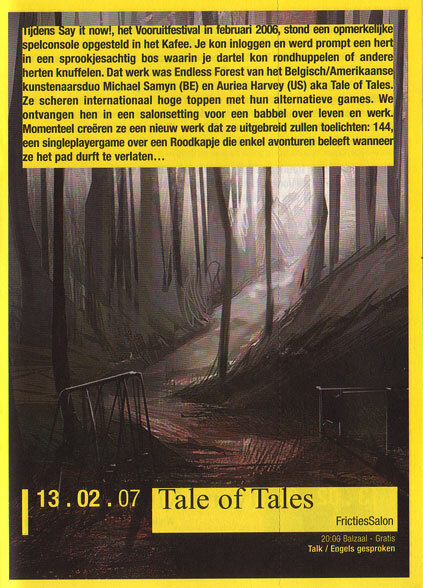 Tale of Tales talks about 144 on 13 Feb 2007, at 8 PM, at The Game Is Up! in Vooruit in Gent. More information here.